Interface pad for Sanding. Interface Pads are used in combination with velcro backed sanding discs for use with sanding rounded surfaces and contours. The interface pad is located between the base plate of the sanding machine and the sanding disc and will produce a softer result. Interface pads are designed for dust free sanding. 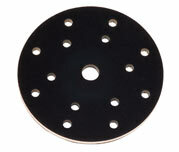 This Interface pad is 150mm (6") with 15 holes.